In the age of ever-growing technology, smart bulbs can be an incredibly useful way to help seniors light up their living areas. . Most smart lights provide hands-free options and schedules to control when lights turn on and off. the assembly required does not take much know-how. After you replace your regular bulbs with smart lights, some minor synching is needed and then everything can be available at the touch of a button. We’ve reviewed a handful of smart lights with different features to aid you in choosing the best light for your home. Why Switch to Smart Light Bulbs? This smart bulb connects with nearly any smart assistant and offers hands-free dimming and energy use observations. The Element Classic Smart LED Bulb is a simple, smart light that connects with Alexa, Google Assistant, Echo Plus, and other smart home assistants. Use voice control to turn on and off lights, adjust brightness, along with other functions. You can also set schedules for the lights to change while you aren’t home. This bulb is also energy efficient. The LED aspect cansave approximately 80% of energy compared to a typical incandescent light. You can even use the Element Home app on your device to monitor your electricity use. Installation is as simple as replacing old bulbs with this new smart light bulb. You can then customize each room setting and mood. As night approaches, you can increase the lighting hands-free or via your app or control center. No additional hubs required for this smart bulb. As long as you have Wi-Fi you can enjoy dimming features and scheduled lighting. The Kasa Smart Wi-Fi LED Light Bulb is an affordable bulb that does not require additional hubs to function with Alexa or Google Assistant. There is a customizable dimming setting so you can match the mood to the room. Controlling the brightness of the lights can also help you at night. You can control the electronics from anywhere inside your home and can prepare a room before entering or turn lights off after leaving. No more running around in the dark looking for switches. Once connected, you can use voice control or an app on a phone or tablet to tell the lights precisely what to do. And setting up a schedule will automatically turn lights on and off. This feature can be used to assist you with your daily routine and is beneficial when you leave the house as the lights continue to function while you are on vacation, making it appear as if someone is still home. 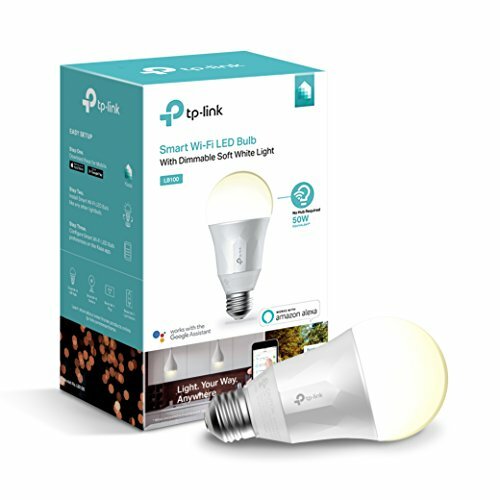 A four-pack of smart bulbs that have excellent range for controlling and use an app or voice control. 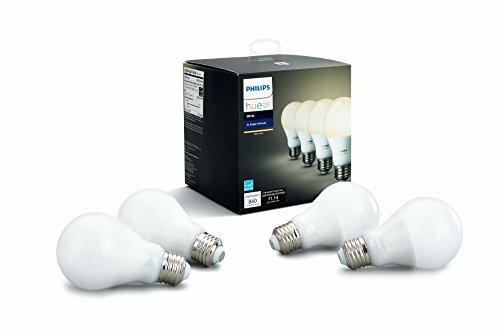 The Philips Hue White A19 LED Smart Bulb comes in a pack of four, so you can set up your home with smart light bulbs. Alexa, Apple HomeKit, and Google Assistant all function well with these bulbs. Installation is a simple as replacing light bulbs. You will also need to purchase a Hue Hub and download the Philips Hue mobile app. Once you pair the devices, you will have clear access to each light and be able to control the lights individually. Voice control offers a hands-free option to change the lighting. Otherwise, an app provides all the information you will need. These light bulbs are also compatible with other lighting system accessories such as dimmer switches, motion sensors and more. The lights are energy-efficient LED and can last over 20 years. When setting the brightness for the lights, they will retain the same level of light the next time you use them. This feature is helpful if you place your bedroom to dim lighting before going to bed because when you wake up, you will have comfortable lighting that you can gradually increase. A high quality light bulb that also works as a speaker, an excellent option that is easy to use. 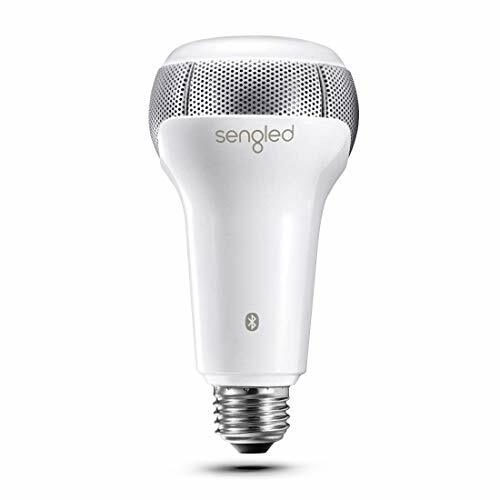 The Sengled Solo Smart Bulb with Bluetooth Dual Speakers is a unique smart light because it also has speakers. It works similar to other smart lights and is controllable with the touch of an app. The speaker aspect works with Bluetooth and allows you to play music through any Bluetooth compatible device. It is a quality speaker that provides clear sound with adjustable volume. The light is completely wireless so you can easily listen to music without tripping over cords. 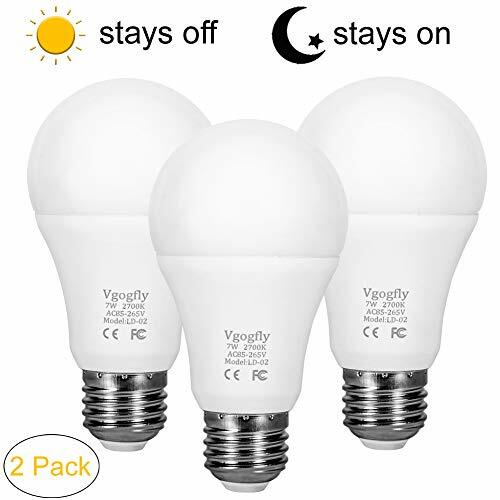 You get the best of everything with this bulb: convenient dimming and control of lights on and off, high-quality audio from the speaker, and the LED aspect provide energy efficient lighting. This light rates for damp environments, which makes it excellent for use in the bathroom, if you like to listen to music while in the shower. It can also be used outside and can play music while you work in the garden or relax on your porch. A multi-colored smart bulb compatible with Alexa and Google Assistant that connects to Wi-Fi, so no additional hubs are required. 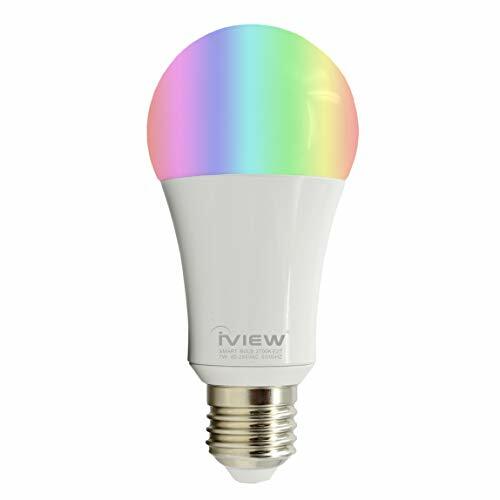 The IVIEW-ISB600 Smart Wi-Fi LED Light Bulb allows for customization of brightness and light color. All colors on the rainbow spectrum are available and can set for specific rooms and specific times. Personalize your rooms and schedule warmer tones for the morning and brighter colors for the evening. Schedules can repeat daily or weekly. One smart bulb is equivalent to 60W of traditional incandescent bulbs. It saves 80% of energy because it is LED and has a lifespan of 20,000 working hours. This light connects via Wi-Fi, so you don’t need any additional hubs to control color and brightness. Voice control is available with apps and lets you dim the lighting, turn lights on and off, and change the color. These lights make an excellent addition for outdoor lighting as they add fun color. You can also choose the setting that is most relaxing for your eyes or change the colors up. A long lasting, energy saving smart bulb that is simple to assemble and use. 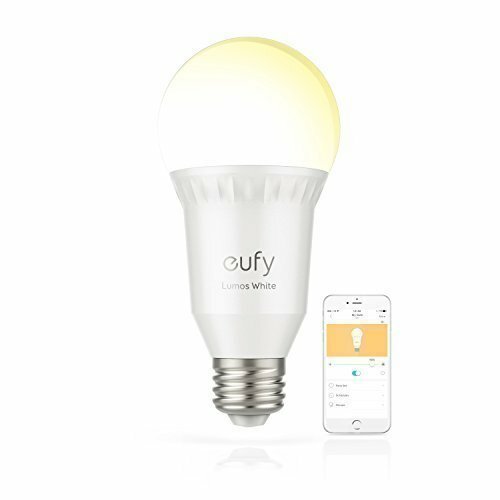 The Eufy Lumos Smart Bulb works with Alexa and Google Assistant directly through Wi-Fi, so no additional hubs are required. You can personalize your home by dimming or brightening the lighting in different rooms. A hands-free option is available with voice control and can turn lights on and off and adjust brightness. Using the app to control lights can be done anywhere, at home or away. Having unlimited access means you can adjust lighting while on vacation to make it appear like people are home. Or set up a schedule to automatically turn lights on and off. The scheduled lighting can also be helpful to wake up to in the morning. Start with dim lighting for a gradual wake up and then increase brightness as you get ready for your day. This LED light is equivalent to a 60W incandescent light but only uses 9W of power. You will save on energy and light bulbs because LED lights have long lifespans of 10-20 years. IMPROVED SECURITY: The light sensor bulbs will light up your home even when you are not around as long as it is dark. The Dusk to Dawn Outdoor Lighting Bulbs work well inside but excels for outdoors use. 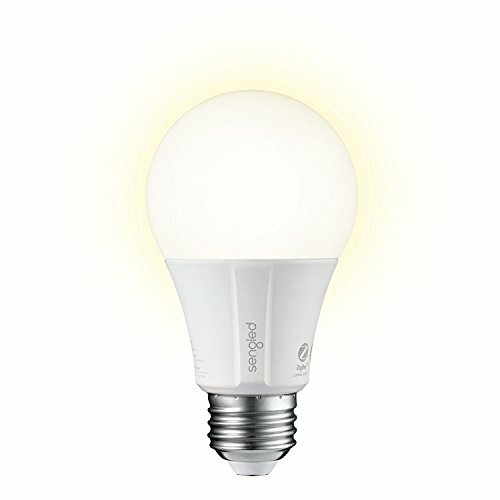 Place for use in your hard, porch, patio or garden and experience an energy saving bulb with longevity. What makes this bulb unique is the Dusk to Dawn feature. There are built-in sensors that automatically turn the bulb on at dusk and turn it off when dawn comes. You don’t need to physically turn the lights on or off or set schedule for them. They continue working even when you aren’t home, providing extra security. Because the lights will be on when it is dark, it is vital that they are energy saving. The LED light uses less power than equivalent incandescent lights and cuts down on energy. It uses a unique cooling requirement that ensures a long lifespan. Smart bulbs are also helpful if you have a larger home or difficulty getting around. As a senior, there are some specific benefits you can gain by using smart lights. Use smart light bulbs to feel confident when you travel on vacation. When you go to visit family or travel to get away for a bit you can schedule your smart lights to turn on and off, making it appear someone is home. You can also schedule your light to turn on when it is time for you to wake up. This feature can be a pleasant way to rise and shine. Dimmed warm lighting can help wake you up or just make it easier for you to start moving around once your alarm goes off. You can also wait until you are safely in bed before verbally turning the lights off. Smart bulbs are also helpful if you have a larger home or difficulty getting around. Instead of walking through each room to check if you have turned the lights off, look at your app to see which lights are still on. And if you place smart light bulbs outside to light up your porch, you can view the stars with the lights off but turn them back on hands-free before getting up to move. Bumping around in the dark is practically eliminated with the use of smart bulbs. If you are a caregiver, smart lights are very beneficial for those who live with dementia as a set schedule of lights can be determined, keeping your loved one on a specific agenda. Lights will turn on when it is time to wake up, and you can efficiently turn lights off if your loved one has exited a room but forgot to turn the lights off. Smart light bulbs are soon to become the new normal as they are energy saving and offer more and more features. When choosing the right bulb for your home, consider if you want to connect your lights to Wi-Fi or would prefer a hub to control all your smart home features. You can also decide if you want a high-tech bulb that has a speaker or multicolored lights. The best part is, no matter what, you can customize your house exactly as you want, and for a pretty reasonable price, as well.